German citizen woman with child in 1710. Home » German citizen woman with child in 1710. German citizen woman with child in 1710, early 18th century. Citizen woman with child in city clothes of the German Rococo, Baroque period. A style mix of different eras. The clear rigor of Spanish fashion in combination of Renaissance elements of the farthingale and finally the Gothic headgear. 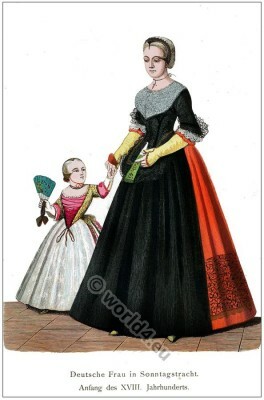 This entry was posted in 1710, 18th Century, Child, Germany, Headdresses and tagged Baroque era, Rococo fashion, Traditional German Costumes on 6/4/13 by world4.